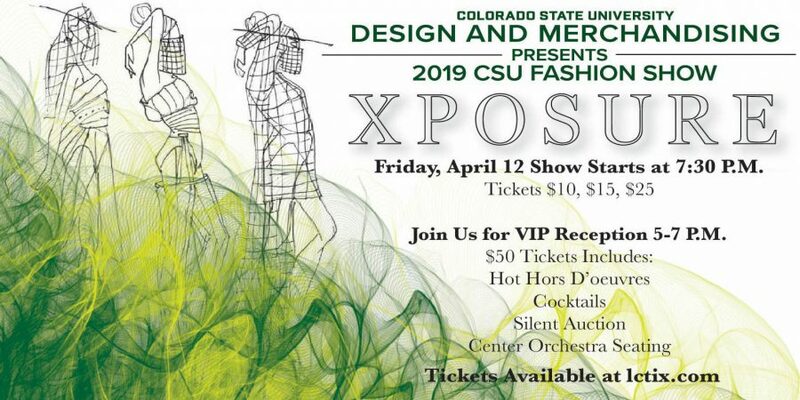 Colorado State University’s annual Fashion Show, run by students in the Department of Design and Merchandising, will be held on Friday, April 12, at 7:30 p.m. at the Lincoln Center in Fort Collins. This year’s show, titled “XPOSURE,” will feature a state-of-the-art stage production built from the ground up by students in the department’s Fashion Show Production and Event Planning class. The show boasts over 100 brilliantly hand-designed and crafted garments, ranging from couture and children’s wear to street wear and active wear. Seventy models will walk in the show, all of whom were selected from an official model call earlier in the spring. Curated and executed entirely by CSU Design and Merchandising students, this show celebrates the 19 senior apparel design and production students’ capstone collections. Some of this year’s students took inspiration from couture techniques, while others took pride in the sustainability of their work, which included upcycled fabrics. The junior apparel design and production students will open the show with original garments inspired by and created from military parachutes. Each year, students in the Fashion Show Production and Event Planning class begin planning the show in August, establishing local sponsorships to help fund the $25,000 cost of the show. Along with regular sponsors like Dillard’s and Christy Sports, the students forged a new partnership with OtterBox through its flagship Fort Collins store, OtterShop, located in Old Town. OtterShop selected original student textile and garment designs inspired by its 2019 line of “Homegrown” phone cases. This collection will be featured in the show as well. Show organizers are also excited about the addition of newly added Diamond Level sponsors, including J&J Construction, Journey Homes, Crow Creek Construction as well as the Demaske, Schumacher and Buckendorf families. XPOSURE will feature a VIP reception, cocktail hour and silent auction before the show; a live musical accompaniment on stage from singer/songwriter Ally Westover; and the opportunity to see the industry’s future fashion designers. Proceeds will pay for a professional trend forecasting service for all CSU students to use. Tickets range in price from $10 to $25, and are available at the Lincoln Center website. More information is available at the Fashion Show web page.